Arab News has reported on Prince Alwaleed bin Talal recent visit to Disneyland Paris and his meeting with Tom Wolber, president of Euro Disney S.A.S, and Mark Stead, CFO. Prince Alwaleed and Tom Wolber, president of Euro Disney, during the meeting in Paris. Prince Alwaleed bin Talal, chairman of Kingdom Holding Company (KHC), met Tom Wolber, president of Euro Disney S.A.S, Paris and Mark Stead, CFO of Disneyland Paris. Nahla Nasser Alanbar, private executive assistant to the chairman, and Fahad bin Saad bin Nafel, executive assistant to the chairman, attended the meeting. During the meeting, the two sides discussed the latest developments in both KHC and Euro Disney in which KHC holds a 10 percent stake. Moreover, Prince Alwaleed and Wolber also discussed a number of general local, regional issues and the current global economic climate. They also discussed Prince Alwaleed’s investments in Euro Disney and France, and the social and economic bi-lateral relations between their respective countries. In August 2014, French President François Hollande and Prince Alwaleed held a meeting at the French presidential Palace, The Elysee. During the meeting, Hollande and Prince Alwaleed discussed political, economic and cultural matters. This is Money has published the following article confirming that Saudi Prince Alwaleed is to join The Walt Disney Company recapitalisation of Euro Disney S.C.A. Saudi billionaire Prince Alwaleed is to join a €420million (£330million) rescue of Euro Disney, after visiting its French theme park last week. Disneyland Paris, which draws more than two million British visitors a year, secured a rescue deal from its biggest shareholder, the Walt Disney Company, last week that will see new shares issued and some of its crippling debt written off. Alwaleed is already a 10 per cent shareholder, but has until now remained silent on whether he would continue to back the French operation. The Walt Disney rescue could have seen his stake cut dramatically unless he invested extra cash himself. His expression of support is seen as a crucial vote of confidence in the ailing French venture. In an exclusive interview with The Mail on Sunday, Alwaleed, who famously sued Forbes magazine for suggesting in its world’s billionaires list that he was worth only $20billion, said: ‘We will fully subscribe to the rights issue because we support France and we support Disney. ‘They will not take our stake. We will maintain 10 per cent,’ he said. Alwaleed said he had decided to invest in the rescue after spending a day at the Disneyland Paris resort on Tuesday and speaking to Walt Disney’s chief executive Bob Iger. Disneyland Paris is Europe’s most popular tourist attraction. Last year it had 14.9million visitors, more than the Eiffel Tower and Louvre combined. British visitors have been critical to keeping the resort open. They are the second most frequent visitors after the French, accounting for 15 per cent in 2013. Tourist attraction: Last year Disneyland Paris had 14.9million visitors. The Walt Disney Company has a 40 per cent stake, with 10 per cent owned by Alwaleed, 5 per cent owned by fund manager Invesco and the rest floated on the Paris Euronext exchange. All share-holders will be able to take part in the rights offer but Disney has said it will buy the shares of investors who do not participate. Disneyland Paris opened in 1992 and racked up a net loss of £598million in a year. It has only turned a profit in eight of the past 22 years and last year lost £61.5million. Disney will swap €600million of Euro Disney’s debt for equity and will defer repayments on its own loans to Euro Disney until 2024 as well as issuing new shares. 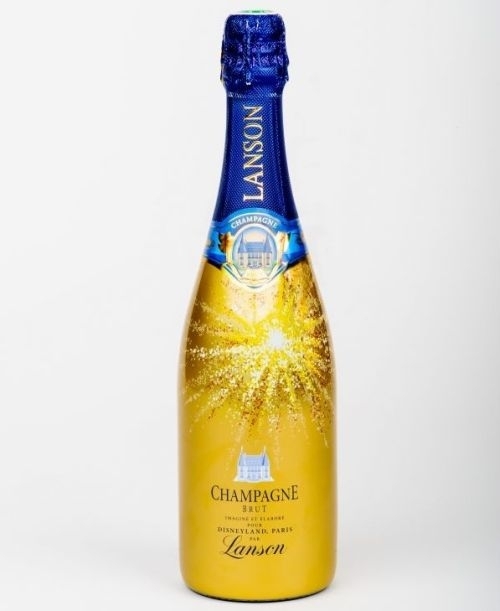 Disneyland Paris is partnering with one of the most illustrious champagne brands in France – Lanson to launch a special vintage. The Cuvée Spéciale Disneyland Paris has been created to celebrate the opening of Ratatouille: The Adventure – L’Aventure Totalement Toquée de Rémy, and you will be able to find this special vintage in the boutiques and resturants in the resort priced at €65. The champagne is said to call to mind the personality of Rémy, the little rat known for his refined palate. This champagne makes a strong impression: Pinot Noir grapes lend powerful fruity notes and roundness, while Chardonnay grapes add suavity and elegance. Here is the official overview of the proposal being presented by Euro Disney S.C.A and TWDC to it’s shareholders. The proposal is designed to improve the financial position of Euro Disney and enable it to continue investing in the guest experience. Improve the Euro Disney Group’s liquidity through interest savings and deferral of amortization of loans until final repayment in 2024. Euro Disney S.C.A. shareholders would have an opportunity to participate in the capital increases of Euro Disney S.C.A. alongside with Disney, at the same price. As a result of the contemplated capital increases of Euro Disney S.C.A. and in accordance with applicable regulations, Disney would be required to launch a tender offer on Euro Disney S.C.A. shares. Euro Disney S.C.A.’s Supervisory Board has expressed unanimous support for this proposal. After the information and consultation of the Workers’ Council and the Shareholders’ approval during the general meeting of ED S.C.A.’s shareholders early 2015, the transactions contemplated by the proposal are expected to be completed in the first semester of calendar 2015. What are the details of the proposal? Despite continued investment in the resort, Euro Disney has been negatively impacted primarily by the challenging economic conditions in Europe. Euro Disney needs to improve its cash balances and reduce its debt to continue to invest in the guest experience. This proposal achieves these goals. Do I have something to do now with respect to this proposal? No. No immediate actions are required from you for now as the transaction is expected to take place first half of calendar year 2015. It’s important to understand all your options and take the time to review them. What are the benefits of the transaction for shareholders? The proposal will improve the financial position of Euro Disney and enable it to continue investing in the destination. This improved financial footing can only benefit the Euro Disney shareholders. My shares were worth 3.46 euros before the announcement, will my holding lose value? The example below demonstrates how to preserve your economic value but is one of many options you have as a shareholder. You have time to review all your investment options as the transaction will occur in the first half of 2015. If you want to guarantee the full value of shares at their pre-announcement share price, you would participate fully in the rights offering and then sell all your shares into the mandatory tender offer. You have the flexibility to pursue a range of options—among them, to fully realize the value of your shares at their pre-announcement share price; to maintain your ownership percentage; or to make no new investment, realize any value from selling your subscription rights, and hold or sell your shares. What are the next steps for implementation of the proposal? Next steps for the proposal include, first the workers’ council’s information and consultation period initiated today, then approval of the shareholders (at a general meeting expected in early 2015) and the delivery of a comfort letter by an independent expert regarding the preliminary opinion on the fairness of the mandatory tender offer price in November. The transaction is expected to take place first half of calendar year 2015. How will this transaction impact admission criteria to the shareholders Club? There will be no changes to the admission criteria for existing members of the Club due to this transaction. However we may adjust admission criteria in the future for new shareholders. Mark Stead, Senior Vice-President Finance, presents the recapitalization operation that was announced by Euro Disney S.C.A. today (October 6, 2014). Members of the Euro Disney S.C.A. Shareholders Club received the following communication from the company this morning regarding todays announcement of the recapitalization project. Euro Disney announced today a 1 billion euro recapitalization, backed by The Walt Disney Company (“TWDC”), aimed at significantly bolstering Euro Disney’s financial position and enabling it to continue investing in the destination, better positioning the company for long-term success. Despite continued investment in the resort, challenging economic conditions in Europe have negatively impacted financial performance, and constrained Euro Disney Group’s ongoing ability to make investments while supporting its debt burden. The contemplated transaction encompasses several components. First, there would be an injection of approximately 420 million euros via capital increases in Euro Disney S.C.A and its principal subsidiary. Second, there would be a significant reduction of the Group’s indebtedness through the conversion of 600 million euros of the debt owed to TWDC into equity of Euro Disney S.C.A. and its principal subsidiary. Lastly, there would be an improvement of the Group’s liquidity via the deferral of amortization of loans until final repayment in 2024. You would have the right to acquire your pro rata portion of the shares in Euro Disney S.C.A. subscribed to by TWDC through its conversion of debt at a price of 1.25 euro per share, i.e., the price paid by TWDC to subscribe such shares. You would also have the option to sell your shares to TWDC after the completion of the capital increases of Euro Disney S .C.A. through a mandatory tender offer required by French law and regulations. The proposal is made by TWDC on the basis of a mandatory tender price of 1.25 euro per share. A more detailed description of the Disney proposal and the conditions which must be met for it to be implemented can be found under “Details of the Proposal” of the press release. If implemented, this operation would mark an important financial milestone for Euro Disney. This new financial foundation would enable us to pursue our investment strategy and better position the Resort for a potential return to growth in Europe. As newly appointed Président of Euro Disney S.A.S., I am delighted to return to Disneyland® Paris after having been part of the Resort’s Grand Opening team in 1992 to lead the group in the implementation of its long-term development strategy. The management team and I are very excited about this transaction, and we sincerely hope you will continue to take an active role in this new era for Disneyland Paris. Disneyland Paris executives will be holding a special meeting with the parks Workers’ Council on Monday to discuss the resorts finances, informed sources have reported. The meeting will begin before the Paris stock exchange opens, which three sources have confirmed separately today. The meeting will focus on the company’s cash flow and the arrival of Euro Disney’s new CEO Tom Wolber in September. The company, when contacted by the press has refused comment but the sources said they had received formal communication regarding the meeting.